The 2019 Apex Lions' Relays will be live on MileSplit. Sign up to watch tomorrows action here! The Girls Premier 100m Dash will be one of the strongest events of the meets and the strongest individually. It's headlined by Jonah Ross (Garner) and Melicia Mouzzon (Heritage) who are some of the top 100m athletes in the country. The two have run 11.60 and 11.74 and will be battling all season as both eye the 4A 100m Dash title. They'll be challenged by sophomore Lia Love (Jordan) and freshman Jahzara Hart (Southeast Raleigh) who have run 11.89 and 11.93. Naelee Stone (Cleveland), Taylor Boykin-Roach (Apex) and Morgan Smalls (Panther Creek) will also be in the mix and will be looking to upset the favorites heading in. Expect the fastest times in the state this season from this race. The battle will be between 200m/400m star and All-American Randolph Ross (Garner) and 200m All-American Romell McRae (Southeast Raleigh). Though the two specialize in other events it'd be no surprise to see them be one of the best in the state in the 100m as well. They hold PRs of 10.79 and 10.80. Two star freshman in Xavier Smith (Jordan) and Trondrick Evans (South Garner) will also battle to show what the future on NC sprinting will hold. The girls 1600m field will be very competitive headlined by Shannon Sefton (Panther Creek) and Emma Kincaid (Grimsley) who have PRs of 5:05 and 5:09 respectively. Behind them are 5 girls that have broken 5:20 and are primed for a breakout in the event. Erin Spreen (Wake Forest), 2A XC and Indoor 3200m state champion Hannah Preisser (Carrboro), Jade Martin (Apex Friendship), Ashley Tysiac (Leesville Road) and indoor 1A/2A 1600m State Champ Sofia Wong (NCSSM) will each be eyeing the individual title in this event. The Roy A. Cooper Premier Mile will be deep and very competitive up front. 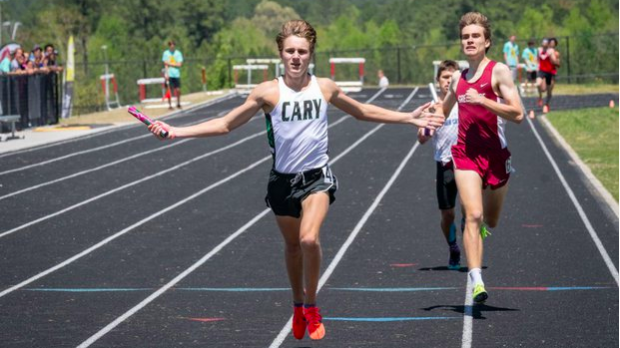 Favorites heading in will be Ian Harrison (Panther Creek) who ran 9:09 last week at Raleigh Relays, Preston Jones (Leesville Road) and Tim Haughton (Apex Friendship). These boys should all have a good shot at breaking the 4:20 mark tomorrow. You'll also have Thomas Vo (Green Hope), Aj Williams (Pinecrest), Cam Milroy (Page) as well as Lowell Hensgen (Cardinal Gibbons). Jones holds the best 1600m PR in the field of 4:20.99. We saw Taylor McKinnon (Cardinal Gibbons) drop a 13.88 at the Patriot Invitational edging Tashayla White (Athens Drive). The two will headline the field this weekend and are pretty big standouts in the premier hurdles field. How much faster can the freshman McKinnon go after an electric start to the 2019 season. The 4x1600m will headline the meet with Cary boys likely loading up their team with their indoor 4xMile and All-American squad. Cary ran 17:31.39 for the full 4xMile setting the overall North Carolina State Record for the 4xMile or 4x1600m. They'll face off against Broughton who is coming off a 4x800m county title where they ran 8:09. You'll also have strong teams from Millbrook, Apex, Durham Academy, Chapel Hill and Cardinal Gibbons slated to compete. Chapel Hill girls will likely run their top team coming off a year where they ran a 9:14.07 for the meet record. They'll be a tough squad to beat with Megan Marvin on anchor. The team ran 9:27 indoors so should be in the low 9:20s if not under tomorrow. They'll have Cardinal Gibbons, Panther Creek, Sanderson and Wake Forest pushing them tomorrow. We should see Southeast Raleigh debut their boys sprint relays this weekend. Indoors they were national champions in the 4x200m, and should be amongst the best in the country in all sprint relays as well. This will be their first real test of the season in these events.